Not much to report today. We left St. David's and headed north to Dolgellau, stopping off for shopping at Lidl on the way. We are staying on a Caravan Club certified location at Abergwynat Farm, which we thought we would miss out on, because when we tried to book they said there was no room. However, then they offered us The Paddock as an alternative, so we quickly accepted. This turned out to be a lovely little walled area by the side of a babbling brook where two vans can park but we had it all to ourselves. From this camp site we knew we could access both Cadair Idris and The Mawddach Trail so it was ideal for our requirements for the next two days. Once we had set up camp, after a very tight squeeze through the gates (inches to spare on either side), we had a quick cuppa and then went for a little walk along the trail towards Penmaenpool toll bridge with the intention of stopping at the pub for a quick pint, but as neither of us had thought to pick up any money our plan failed. Never mind, we did a quick scurry back to the van for dinner and a glass of pop. Today was the big one!! We left the camp site loaded with food, water and warm clothing and headed up the drive, then across the road and up an increasingly steep hill towards the Youth Hostel which sits in Cadair Idris's forbidding shadow. The road and then the path followed a fast flowing river that tumbled over numerous rocks and fallen trees and wended it's way through ancient woodland past Tynyceunant Farm and eventually led us onto another road. Immediately across the road was the track that was going to lead us to the Pony Path, which was our chosen route up Cadair Idris. This first part of the route proved doubly difficult due to it's extreme steepness and the previous day's rain running down the hillside in torrents. At this early stage I think we both suffered doubts as to whether we could make it all the way, but we persevered and once we found the Pony Path, the terrain eased with the help of the stones that had been set out to reduce erosion and keep hikers on the correct trail. However, the trail was still unrelenting in it's steepness, and in parts, marked only by cairns over very rocky ground. We went onwards and upwards until we came to the last few hundred yards which became a scramble where you needed to use hands and feet to progress, and by this time the wind was picking up and it was quite cold, but undeterred we finally reached our goal and scrambled over the rocky scree to the trig point for photos. Whoops, we had to have separate ones cos we forgot our selfie stick!! We had a quick look round and took a few more photos of 'views' and then started back down with a plan to get out of the wind so that we could sit and enjoy our hot soup and cake. From here on it was just a matter of retracing our steps back to the Tardis and by the time we got there we were both more than ready to put our feet up and relax for the rest of the evening. We estimate that the walk was approximately 10 miles in length but with all the ups and downs it seemed further. Today was a recovery day with a nice relaxing cycle ride (just a little 28 miles!) 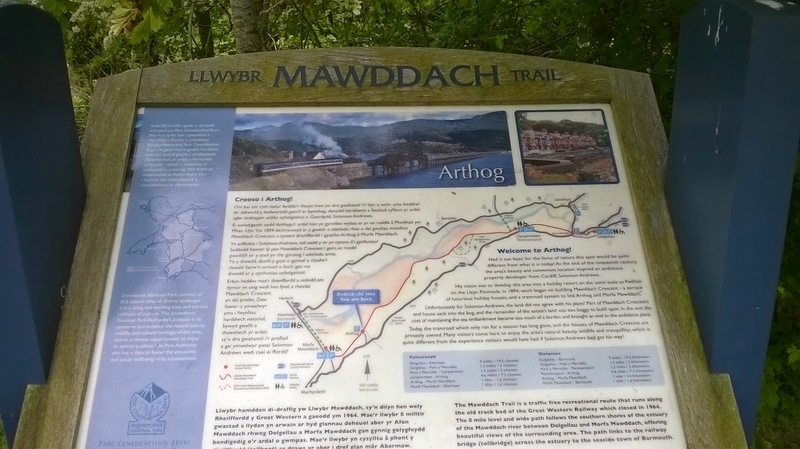 along the lovely Mawddach Trail. Again, we set off from the camp site and joined the trail about half way along it's length. 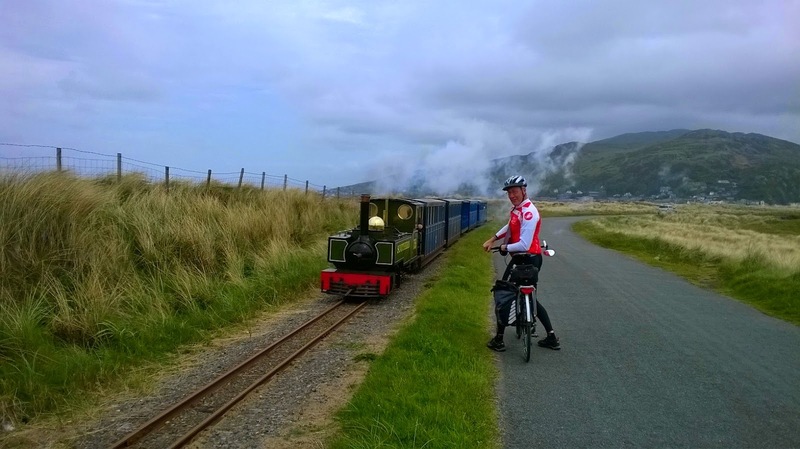 We headed towards Barmouth but we got sidetracked by a new path which lead to Fairbourne. 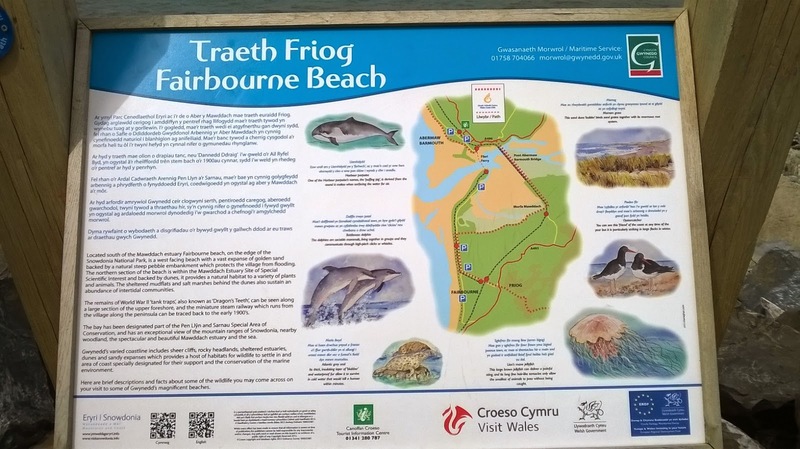 This took us across salt marshes where sheep stood knee deep in the water looking rather silly (but then they usually are silly), and where numerous people strolled with there dogs taking in the lovely views of the estuary and Barmouth Bridge. As we came to the end of the path we turned right and followed a minor road and I asked John if he could see the smoke. 'Oh' I said,' it looks like a little train'. He agreed he could see smoke but he said 'it's probably someone's bonfire'. Ayup Lin, Here comes that bonfire!! We continued on to the end of the Spit and then retraced our tyre tracks back into Fairbourne and rode as far as we could the other way to the end of the sea wall. 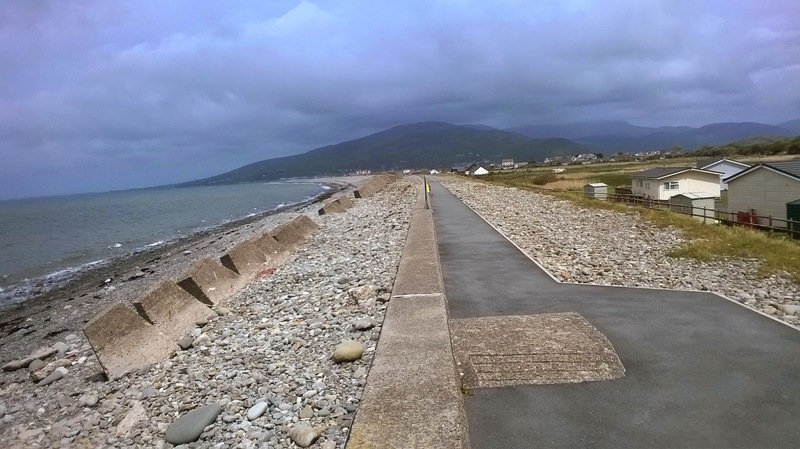 We passed numerous Dragon's teeth on the way which were left over tank traps from World War Two, and now add to the sea defences for the little hamlet of Fairbourne. From here we headed back across the salt marshes and then on to Barmouth, thinking we would have to pay the return fair for crossing the Toll Bridge twice. I was going to ask if they did a cheap rate for return, but when we got there it was unattended and therefore we had free passage both ways, and this was very fortuitous, because with the money we saved we brought chips to add to our lunch. 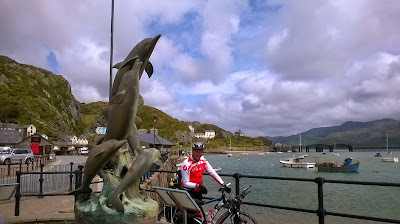 We sat on Barmouth sea front to eat, and down came the rain. Luckily it was very short lived and we didn't end up with soggy chips because a very short while later the sun came out and warmed us up nicely. After lunch we started on our return journey along the Mawddach Trail and decided to follow it to it's end at Dolgellau. We had a little look around the shops and brought a couple of nice cakes which we scoffed on the way back and it was a good job because we needed the energy to fight against the headwind which we hadn't noticed when it was on our backs.